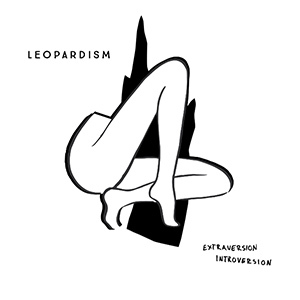 Extraversion/ Introversion as a whole is a flawless skeleton of songs drawing from rock and pop and perfectly settling in the band’s self-described styles of Marg Prock and Cool Pop. This Montreal-based duo consists of Samuel Grandholm, whose gritty voice glazes over themes about his libido and rockstar aspirations. His voice’s grainy quality seems to have more natural distortion than his completely clean guitar—which remains completely clean throughout the album. “Faithful” and “Space Unicorn” both unfold in ambiguous directions by jumping from quirky single-noted guitar riffs, to strong rock and roll choruses, to soft muted strumming and gentle vocals. Victor Tremblay-Desrosiers’ drumming is mixed-in at a high level, allowing for a clear platform to sample Tremblay-Derosier’s percussionary creativity. Though the songs demand attention naturally because of the tight and clever melodies, it runs on for, about, five songs too long. The last half of the album sticks together like an indecipherable cluster, especially because of the absence of any new sounds being introduced. The band’s got creative talent, but the lack of detail leaves the album under-processed and repetitive; maybe try a chorus pedal?